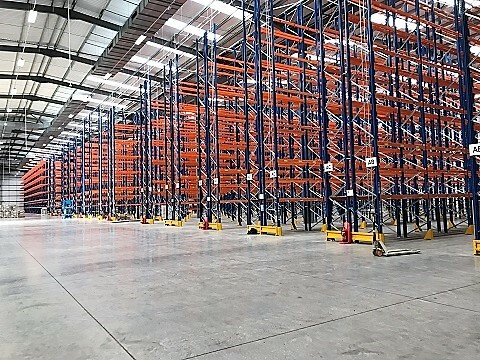 Warehouse storage solutions have for many years bee one of the UK’s leading suppliers of pallet racking solutions to customers in the Oldham, Ashton under Lyne and Heywood area. Our specialist sales teams cover the United Kingdom from out base in the North and would be delighted to arrange to visit in order to discuss which options may be the most suitable for you to get the most out of your premises. Many companies face the prospect of relocating which can often be a very expensive option when in many cases it may be possible to get far more space out of your existing footprint with an innovative storage solution or mezzanine floor. Our ethos is based of giving best advice to customers and find solutions that give you the best and cost effective solution possible. For over 20 years we have built up a large customer base across the Oldham area and across the UK. We take on projects of all sizes from small pallet racking requirements through to Multi-National corporations kitting out state of the art distribution facilities of 1,000,000 cubic feet and more with tens of thousands of pallet spaces! No job too small or large and every one is treated with the same attention to detail using the finest quality components available. The vast majority of the new work we pick us is a result of referrals from satisfied clients and our ability to retain clients for many years is a source of pride for us. There are many innovative pallet racking solutions available dependent upon your requirements. days. Our service is truly bespoke this means we are able to offer every customer a tailored solution that exactly meets your requirements both operationally and budgetary. Our most popular system for customers, it is very versatile and can be assembled I a wide range of differing configurations. Versatility in enabling differing heights it is usually built with wide aisles to give easy access. A system that is good for areas where you need bulk storage, the pallets are loaded onto rails as each new pallet is loaded it gently pushes the others back and can take a maximum of 6 pallets deep – this can be done without specialist handling systems. By doubling the depth of the pallets you can double the storage capacity in one simple solution. It does mean that fork lift trucks with telescopic forks will be required to load safely but most find the investment is really worth it. In many high volume facilities where stock rotation is critical (foodstuffs and pharmaceuticals as an example) installing a Pallet Racking are a great option. It works by having rollers that are slightly inclined that means gravity is able to smoothly move pallets one end (unloading dock) through to the loading area. If you need a dense storage area then this option can work really well. If it is used in conjunction with specialist handling equipment you can really maximise the amount you can store and better still it is a really cost effective option. As the name suggests fork lift trucks are able to enter to enter the storage lane making the most out of both the floor space and the available height. You may be considering a move or what to do in order to get the best out of your existing storage space, relocate, extend or re configure? If this is you then call the experts today, we are happy to come and look at all options and advise on the best course. We offer no obligation quotations and are highly responsive.